A few months ago, I went through an extensive testing process to find the very best active noise canceling (ANC) headphones and found the Bose QuietComfort 25 to have an unmatched combination of audio quality, noise reduction and comfort. 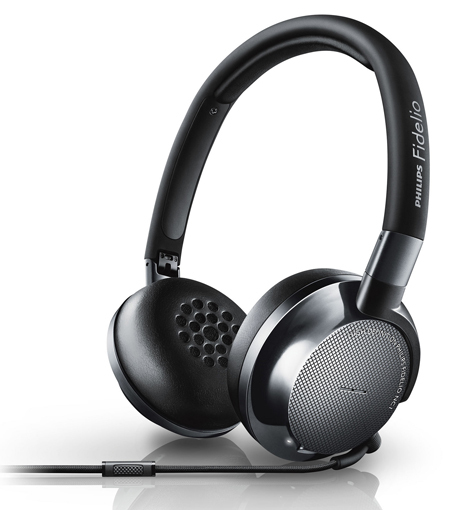 So when I got in the Philips Fidelio NC1 headphones ($299), the Bose QuietComfort 25 headphones ($299) were my gold standard. No longer. For comfort, sound quality and ability to eliminate noise, the Philips Fidelio NC1 are my new pick for the best noise canceling headphones. Here's why. The designers of the Bose QuiteComfort 25 (QC25) and the Philips Fidelio NC1 (NC1) took two opposite ergonomic design tacks to tackle noise cancellation. Bose went with the perfectly logical and normal fully closed earcup design, which cuts around a quarter of ambient sound and gives the noise canceling circuitry a head start. Instead of "closed" full cup ear pieces, the NC1s are so-called "open" style – they lay flat on the ears, an arrangement that, theoretically, lets lots of ambient noise leak in, which increases the amount of work the noise canceling circuitry has to do. Equipping noise canceling headphones with open-style earpads is akin to equipping a car with a screen instead of a windshield but hyping the inclusion of cutting-edge windshield wipers. But I was wrong. The earpads of the NC1s are made from memory foam, which forms a nice, comfortable noise seal on your ear unlike any open-style headphones, noise canceling or not, I've ever worn. Color me slightly shocked. By going with memory foam, Philips has managed to shrink the earpads on the NC1 to around two-thirds the size of those on the Bose. Since both these headphones are designed to be toted and worn on planes, this size difference gives the NC1s a portage advantage. Both sets of phones collapse and roll up into a fetal ball. But the NC1s can be laid flatter and thinner, and their carry-on case is smaller, which means more room in your carry-on and more room either in your lap, the seat tray or seat pocket to store them during your flight. I found the slightly lighter and smaller NC1s more comfortable and less constrictive to wear over the course of several hours of flying than the QC25s, as will anyone with a hat size larger than, say 7 1/4. Not that the Bose are UNcomfortable – they're not – it's just that the NC1s are MORE comfortable. The NC1s also lie more comfortably around your neck when you slip them down off your ears. Not only are the QC25s' cups bulkier than the NC1s, but they face uncomfortably outward instead of resting softly on your collar bone. And the NC1s' headband is thinner, which is easier on the head when you're wearing them and on the back of the neck when you're not. In addition, the NC1s' earpad covering material (the specs didn't identify the material, but it feels like a light leathery cloth) is quite breathable – it didn't get sweaty after several hours of flush on-ear wearing. Finally, with their sort-of open earpads, the NC1s made me feel less claustrophobic than the QC25s while trapped inside a cramped economy Airbus 330 cabin. To test the active noise canceling (ANC) capabilities of both headphones, I alternately wore both the QC25s and the NC1s on a succession of flights (much to the bemused confusion of my varying seat neighbors), and additional listening at home with the TV on and while my PC sound system played a YouTube video of airplane cabin noise at 80db. Considering their open design, the memory foam on the NC1s did a remarkable job of blunting nearly the same amount of ambient noise before turning on active noise canceling as the QC25s. With their ANC activated, both phones canceled – actually, more like muffled – around half of the remaining ambient engine hum and nearby conversation/TV noise. Both transformed engine hum from a deep rumbling hum to more like that from a bathroom hand blower heard from outside the door, and conversation seemed to shift aurally from next to me to a distant room. Music then drowns out any remaining ambient annoyances. All things considered, I'd have to give a slight noise canceling edge to the Bose – but very slight, only detected with back-and-forth A-B comparisons. One difference you can sense between the two is the air pressure vacuum in your inner ear with the ANC switched on, which seemed more acute with the QC25s than the NC1s. Just as the QC25s and NC1s have opposing earpad designs, each also seems to follow opposite sound equalization approaches. Before I compare and critique, understand both headphones sound excellent for noise canceling headphones – just different. With ANC on, the NC1s sound fuller and smoother, compared to the thinner, higher-end-centric QC25s; which is "better" is pure personal preference. You get slightly more boom and bottom with the NC1s as well, although neither will be mistaken for a pair of Beats. Bass is one of the sacrifices you make with noise canceling headphones, regardless of make. Generally speaking, the better the ANC, the less bass. In practical music-listening terms, bassier music such as alt rock and hip-hop, along with classical might be more suited for listening to the NC1s, while pop, jazz, Broadway, dinosaur rock and live recordings might be better served by the QC25s. Separating the two is how they sound with the ANC off. With no ANC, sound on the NC1s gets tinnier – not bad, the music just loses its fullness. With no ANC, the Bose become nearly unlistenable. Music suddenly sounds as if it's emanating from a noisy party in the cheap hotel room next door – muffled and barely audible above the remaining plane hum. For movie watching/listening, the open style of the NC1s made surround movies more enveloping, as if the action and the swelling soundtrack were around you as in a movie theater, rather than bottled inside the closed earcups of the QC25s. When I tried each for quiet late night TV watching, I found the Bose couldn't handle the center channel on some talk shows; I got a lot of audience reaction from the sides, but the talking in the middle was muted. I had no such problems with the NC1s. The NC1s' integrated rechargeable battery will last around 30 hours, and then need a few hours to recharge. The QC25s run on a single AAA battery that supplies around 35 hours of ANC and, when it dies, you just slip in a new battery for more ANC. That's why it's a good thing you can still listen to the NC1s once their ANC power is completely drained. Both headphones feature detachable cables so you can wear either if you just want unconnected sleeping silence. Both cables also feature convenient right angle jacks. The Bose cable includes in-line mic, pause and volume controls, the Philips just pause and mic. Both phones also include airplane two-prong adapters. And no one is more pleasantly surprised by this conclusion than I am. What I’m waiting for is Bose to come out with a noise cancelling and BT design to finally eliminate the need for any cords. Bose provides BT earphones but they don’t have ANC. I currently have Samsung Level Over with has both ANC and BT. Like them but they are big and do not fold so traveling is an issue. For flights I used Bose QC 20’s ear buds which do an amazing job (but they are wired). When active noise cancelling (ANC) is turned on, should background noise (e.g. vehicle noises) be reduced even when there is no music playing? I know this is the case iwth many noise-cancelling headphones. I have some Fidelio NC1s, and I find no difference between ANC on and ANC off (noises are reduced by the physical barrier of the earpads, but there is no further reduction by turning ANC on). When I turn on the ANC, there is a brief hiss, and there is also a difference in how music sounds with ANC on versus ANC off - so it is having some effect. But ANC does not appear to reduce background noises.